Ian Davis needs a hot cup of coffee. It’s early on a Friday morning in the West Bottoms, but the 24-year-old owner of Blip Roasters is not tired. He’s just looking for a bit of warmth in the wood and brick space that winter keeps leaking into through a pair of garage doors. As a conical space heater gives off a faint roar at his feet, Davis grinds and measures coffee beans for his morning cup. He lays out a filter and prepares to slowly pour water over the grounds, just as he has done hundreds of times since launching Blip in December 2014. “Coffee is this kind of catalyst. It’s an opportunity to meet people, and you don’t really find that with a lot of goods. Coffee is a never-ending conversation starter,” Davis says. He warms up to conversation like the electric kettle by his right hand — a quick spark and then a rapid boil. He says it’s always been easy for him to chat over a cup. Despite his age, Davis is a familiar face on the Kansas City coffee scene. He started as a barista at the now-shuttered Oak Street Coffee in Brookside. “There was a great community at Oak Street. It was back in the time of our lives when everybody would end up there because we didn’t have cell phones. You would just drink your coffee, and everybody would show up,” Davis says. For three years, he also ran the coffee program at Aixois in Crestwood. He watched and poured as roasters like Oddly Correct and Thou Mayest found shelf space alongside the Broadway Cafe and Roasting Company. After a bad break-up, Davis needed a break from Kansas City. A former colleague at Oak Street Coffee invited him out to Charleston, South Carolina, where he found himself reinvigorated by the craft beverage scene there. 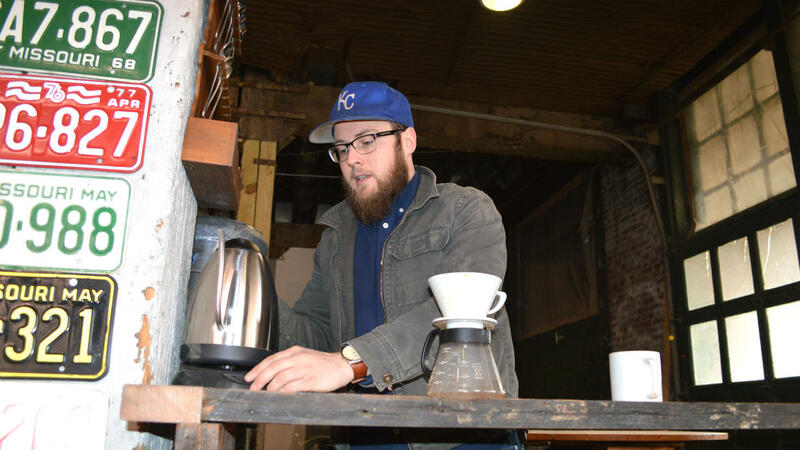 He returned to KC in 2014 and realized he wanted his future to be in coffee. “I came back, and I found myself with the same opportunity with jobs and positions. I was tired of making other people money,” Davis says. A motorcycle enthusiast, he decided to blend the style and feel of bikes with roasting. Blip — a term used to describe a quick twitch of the throttle — was born. In the unfinished space on Saint Louis Avenue, helmets adorn the walls and a pair of vintage motorcycles are propped a few feet from the room that Davis is hoping to transform into his coffee bar. In addition to the design elements, he’s also working with several area motorcycle and bicycling clubs, the Kansas City Vintage Japanese Motorcyle Club and Midwest Velo among them. Blip will be a starting point on the upcoming Caffeine Crawl in April, in part because The Lab’s Jason Burton (the founder of the Caffeine Crawl) knew Davis from his time as a barista at Oak Street Coffee. “I’m seeing things come full circle, which is what I want Blip to be about,” Davis says. A gleaming drum roaster sits in the front of the square space, a short stack of coffee bags on pallets nearby. “I lost my nice truck, but I got my roaster,” Davis says of his biggest purchase to date. He understands that coffee is becoming a crowded commodity in Kansas City. In an effort to stand out, he’s packaging his coffee in cardboard boxes stamped with Blip’s logo and focusing on light and medium roasts meant to highlight the chocolaty and floral flavors in beans from Guatemala. As he waits for the representatives of a construction company to arrive, Davis shares his plans for Blip. His beans are currently only used by Alchemy Coffee in Lawrence, Kansas, although Davis has been doing a series of pop-up pourovers at weekend flea markets in the Bottoms. He gives the trio of builders a brief tour before opening up a set of architectural drawings on a circular wooden tabletop regularly used for cupping. The drawings depict the walk-up café that would transform the current loading dock area. Davis envisions a café with no seats, the kind of place that would draw in neighbors or those out for a bike ride.